In theory, Noteshelf is a great concept: take the basic note-taking concept and combine it with Apple’s iBook bookshelf aesthetic, and add in some neat functionality to make a handy tool for students, writers, and anyone else looking to keep running notes on multiple topics. The app features seventeen different ink types, twelve different paper types (legal, wide-rule, grid, etc. ), and the ability to highlight notes so they’re easy to locate later. The variety of notebook types is a really nice feature. There are the aforementioned “general” notebook types, as well as business and home/personal types. 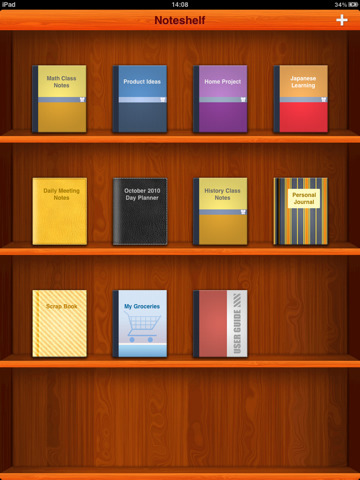 These include day planners, task lists, journals, scrapbooks, shopping lists, and more. And if you’re looking to further personalize your notes, users can insert images from their iPad photo library and add a multitude of emoticons (smilies) and other icons. For those worrying about comfort (and carpal-tunnel), Noteshelf has a “Wrist Protection” feature, which allows you to rest your wrist on the lower half of the screen while you write. It’s a nice touch, though you’ll quickly find yourself out of wrist real estate as you get near the middle-to-lower half of the page. It makes one wonder why they didn’t opt for scrolling pages rather than realistic, flippable pages. 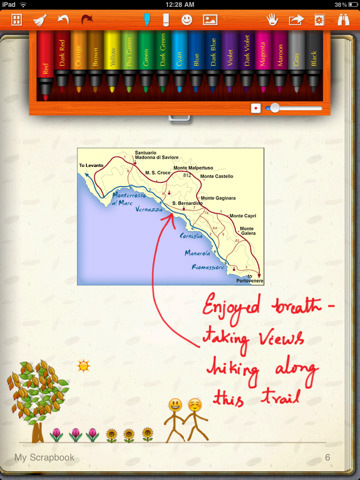 Where Noteshelf stumbles is in the execution. All of these wonderful features don’t amount to much if the actual practice of writing feels cumbersome. The first problem is that while Noteshelf claims to be stylus compatible, the iPad screen requires a capacitive stylus, meaning not just any old stylus will do. If you don’t have a capacitive stylus lying around, using your finger is your only option. And, frankly, it’s a lousy option. Rather than seeing your elegant (or chicken scratch) handwriting, your notes will look as though they were taken with a crayon. And to make matters worse, there is significant input lag. After using Noteshelf for hours, I still never really felt like I was writing with a pen and paper. My handwriting was almost illegible (more than usual) and staying on even the wide-ruled lines was a challenge. This major problem would have been averted if Noteshelf had an onscreen keyboard/typing feature. It doesn’t. Other missing features include the ability to cut/copy/paste, password protection, and the ability to to email more than one page at a time (though you can export all pages to iTunes). It’s a shame because, like I mentioned earlier, Noteshelf could be a wonderful product. The feature set is fantastic and the layout is almost perfect. If the developers are able to update the app with improved speed and better accuracy, Noteshelf could be the ideal note-taking application. Until then, I’ll stick with my pad and paper. Bottom Line: Noteshelf is an ambitious note-taking application that doesn’t come through as a replacement to the old fashioned pad and paper. 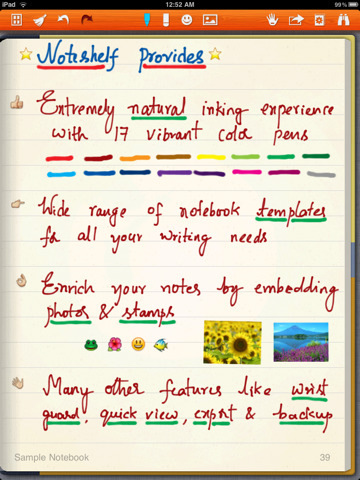 Noteshelf is compatible with iPad and requires iOS 3.2 or later.